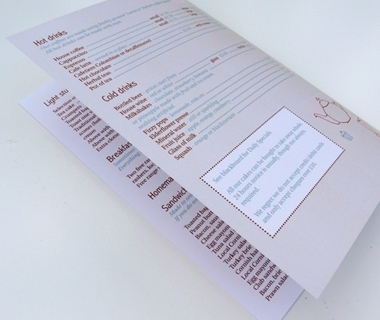 The four page, matt laminated menu we designed and printed for Caraways Cafe. Each page of the menu is A5 and it is printed on 200gsm stock, matt laminated for durability. We filled the menu with illustrations based on tea and coffee to give the Caraways menu the same friendly appeal as their cafe.